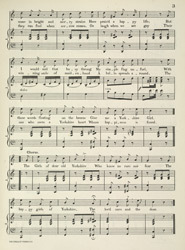 From the middle of the 19th Century music in the home became more and more popular. Once the price of musical instruments was reduced, pianos were popular, not just as a status symbol but as a form of entertainment and families would gather around to play and sing popular songs. Songs with references to local areas or towns were popular as they helped to create social awareness and local pride. This song stereotypes girls from Yorkshire as always happy and cheerful and suggests that this quality makes them 'good marriage material'.